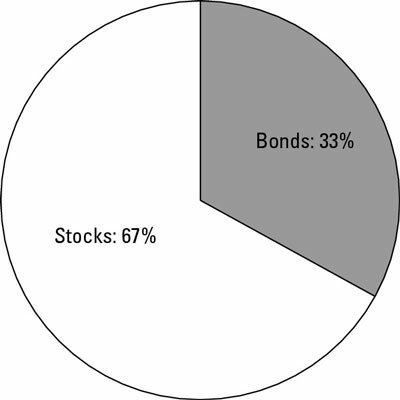 The following example investment portfolios are all based on real, live clients who with bond portfolios. All names and most identifying information have been changed to protect the identities of these good people. Perhaps you will see some similarities between their situations and yours. Married in 1982, Jean and Raymond raised three children; the third is just finishing up college. Jean and Raymond are both public school teachers and both will retire (he in two years; she in four) with healthy traditional pensions. Together, those pensions, combined with Social Security, should cover Jean and Raymond’s living expenses for the rest of their lives. The couple will also likely bring in supplemental income from private tutoring. Jean’s mother is 90. When Mom passes away, Jean, an only child, expects to receive an inheritance of at least $1.5 million. Mom’s money is invested almost entirely in bonds and CDs. So what should Jean and Raymond do with the $710,000 they’ve socked away in their combined 403(b) retirement plans? Jean and Raymond are in the catbird seat. Even if they were to invest the entire $710,000 nest egg in stocks, and even if we were to see the worst stock market crash in history, Jean and Raymond would likely still be okay. The couple certainly doesn’t need to take the risk of putting their money in stocks because they don’t need to see their portfolio grow in order to accomplish their financial goals. But given their pensions, is investing in stocks really that risky? No. If Jean and Raymond desire to leave a large legacy (to their children, grandchildren, or charity), a predominantly stock portfolio may be the way to go. Because equities tend to be so much more lucrative than fixed income in the long run, a greater percentage in equities would likely generate more wealth for the future generations. Ignoring for the moment a slew of possibly complicating factors from the simple scenario above, they should feel comfortable with an aggressive portfolio: perhaps two-thirds in equity (stocks and such) and one-third in fixed income (bonds and such). This breakdown is shown below. It’s not what most people think of as appropriate for an “aging” couple, but it makes a whole lot of sense, provided Jean and Raymond are fully on board and promise not to cash out of stocks (as many investors do) the first time the market takes a dip. Kay, divorced twice, earns a very modest salary as a medical technician. She scored fairly well in her last divorce. Thanks to a generous initial cash settlement, as well as having made a good profit on the sale of her last home, Kay has a portfolio of $875,000. Kay doesn’t hate her work, but she isn’t crazy about it, either; she would much rather spend her days doing volunteer work for stray animals. After careful analysis, she figures that she can live without the paycheck quite comfortably if allowed to pull $45,000 a year from savings. Her children are grown and self-sufficient. 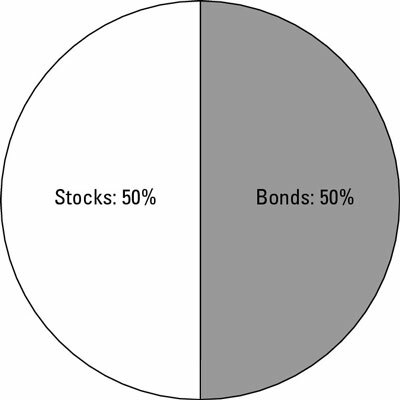 Kay’s example illustrates why simple formulas (such as your age = your proper bond allocation) don’t work. Kay is roughly the same age as Jean in the previous example. And Kay, like Jean, is financially comfortable. But it would be a great mistake for Kay to take the same risks with her money. Unlike Jean, Kay does not have a spouse. Unlike Jean, Kay does not have a pension. Unlike Jean, Kay is not expecting a big inheritance. Unlike Jean and Raymond, Kay cannot afford to lose any significant portion of her nest egg. She is dependent on that nest egg to stay economically afloat. At her current level of savings and with a fairly modest rate of growth in her portfolio, Kay should be able to retire comfortably within four to five years. In Kay’s case, she has more to lose than to gain by taking any great risk in the markets. On the other hand, if things work out as she plans, Kay may be spending 30 or more years in retirement. So an all fixed-income portfolio, which could get gobbled up by inflation, won’t work. 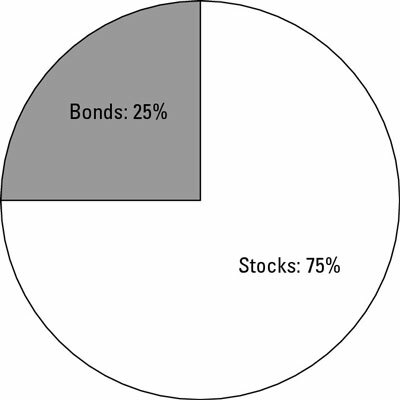 In Kay’s case, a good recommendation would be a portfolio, somewhat depending on Kay’s tolerance for risk, of 50 to 55 percent stocks and 45 to 50 percent bonds, as shown. Three years out of business school with an MBA, Juan, single and happy in his city condo, is earning an impressive and growing salary. But because he has been busy paying off loans, he has just started to build his savings. Juan’s 401(k) has a current balance of $3,700. Juan — yet another example of why simple formulas don’t work! — should probably tailor his portfolio to look something like Jean and Raymond’s, despite the obvious differences in age and wealth. Juan is still many years off from retirement and doesn’t see any major expenses on the horizon. Juan’s budding 401(k) is meant to sit and grow for a very long time — at least three decades. History tells us that a portfolio made up of mostly stocks will likely provide superior growth. Of course, history is history, and we don’t know what the future would bring. So it would still be a good idea to allocate 20 to 25 percent bonds to Juan’s portfolio. 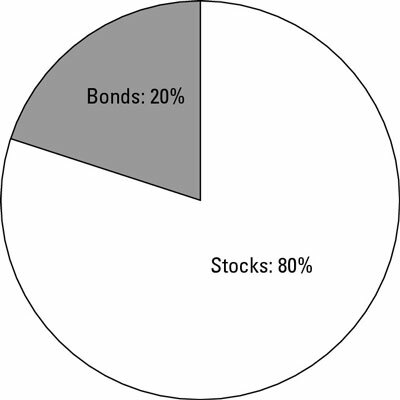 Before moving any money into stocks or bonds, however, Juan would want to set aside three to six months’ worth of living expenses in an emergency cash fund, outside of his 401(k), just in case he should lose his job, have serious health issues, or become subject to some other unforeseen crisis. Never married, with no children, Miriam wants to retire from her job as a freelance computer consultant while still young enough to fulfill her dreams of world travel. Her investments of $75,000 are growing at a good clip, as she is currently socking away a full 20 percent of her after-tax earnings — about $20,000 a year. But she knows that she has a long way to go. Miriam is right; she has a long way to go. To fulfill her dreams of world travel, Miriam needs considerably more than a nest egg of $75,000. In this case, the bond allocation question is a tough one. Miriam needs substantial growth, but she isn’t in a position to risk what she has, either. Cases like Miriam’s require delicate balance. She should most likely opt for a starting portfolio of mostly stocks and about 25 to 30 percent bonds (see Figure 12-6), but as Miriam gets closer to her financial goal in coming years, she could up that percentage of bonds and take a more defensive, conservative position.